As a dermatologist, I am constantly bombarded with reps approaching me with each new product on the South African market. Factor this together with patients mailing me the details of their skincare regimen to give an opinion on and you can understand how products start to blur into each-other. If I feel overwhelmed by the multitude of options even with my solid foundation and understanding of ingredients, how much more overwhelmed are my patients feeling? Cosmetics vs cosmeceuticals, skin types, budget constraints, specific issues of concern such as pigmentation…and all this before even touching on how “clean” the ingredients are! Inevitably so many of my consultations end on “So which products should I be using on my skin?” Uncomfortable with recommending premium priced products when I know that my patients’ skincare needs are constantly in flux and even more concerned about the actual contents of the creams, I started intensively researching. The average woman applies 130 unique toxic chemicals before breakfast. Think about face serums, creams, sunscreens, toothpaste, hand soap, shampoo, makeup…Ingredients such as sodium laureth sulfate in cleansers, phthalates in fragrances, mineral oils, harmful contaminants in the “PEGs” and ceteareth…these ingredients can be disruptive to both immune health as well as hormonal health and some have even been found to be carcinogenic. 56% of products contain chemicals which are “penetration enhancers”. This means that they help other chemicals penetrate faster and deeper into the body. 87% of ingredients in personal care products have been completely unregulated and have not been assessed for safety by the Cosmetic Ingredient Review, the cosmetic industry’s self-policing safety panel. When we use these products on ourselves and our children on a daily basis, the toxins build up and accumulate within our bodies – a process called “bioaccumulation.” This means that the more we expose ourselves to these toxins, the harder it is for our bodies to break them down. Because of this build up, it causes both minor and major health issues that otherwise could be prevented if we simply cut out those toxins. My research went into overdrive and a thought started to germinate and take shape. What if we could develop clean, non-toxic skincare products which were affordable and completely personalised? The result: a three-way partnership between a dermatology team, an international research laboratory and a compounding pharmacy. And Root4 was born. 1. 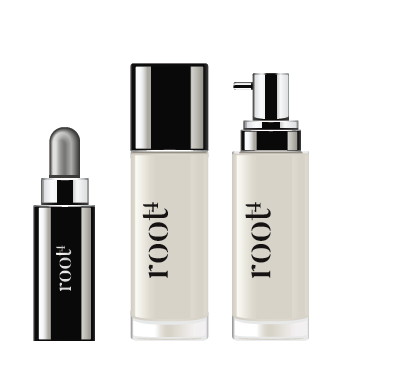 Root – the source, or origin of something which lends itself to the foundation of skin health. 2. The number 4 symbolizing the 4th star of Root (the Beta Librae star) which is the only inherently green star. The star symbol ties into the guiding light concept of the our practice’s star icon. 3. The play on the word route in root hinting at a journey to clean, healthy skin. Clean: Because it’s not only about the ingredients in your skincare products, but the ones which are not. We are committed to blending the most innovative combinations of non-toxic, active ingredients. Natural: Our hero product – a “blood-serum” – is developed using anti-inflammatory mediators from your own blood which has been “tricked” into thinking that it is in a wound environment! Because what is more natural than your own blood? Custom-designed: We believe that your skincare should be as unique as you are. There are no cookie-cutter approaches here. Your skin, your specific needs, your own products. It’s as simple as that. GUIDED BY SCIENCE: We understand that healthy skin is driven not only by your genetics but also by your environment and lifestyle. Using a unique combination of comprehensive history-taking and clinical examination, DNA testing, Visia skin analysis and a bioscan which uses galvanic skin response to assess which ingredients your body is biologically coherent with, we will then formulate your own personalised skincare recipe. Adaptable: No more big financial outlay for a full set of products only to find that either they don’t work for you or that your needs then change. Compounded especially for you on a month to month basis, the ingredients in your creams can be updated as often as you like. Go and look this up for yourself. Visit the Environmental Working Group’s Skindeep website at https://www.ewg.org/skindeep/ . Plug in the ingredients of your products, and see how high it is rated in toxicity. Or, download the “Think Dirty” app on your phone and look at the toxicity levels. Information is power.